Garcinia cambogia (G. cambogia) is a plant native to Indonesia. "Garcinia" dietary supplements generally contain extracts of the dried rind of the fruit of this plant. The compound hydroxycitric acid (HCA), believed to be a key active Garcinia component for biological effects, naturally comprises up to 30% of the weight of the dried rind and typically, 50% to 60% of the weight of extracts made from the dried rind. The evidence that HCA from Garcinia aids weight loss is mixed. Laboratory studies of HCA given to animals have demonstrated suppression of food intake and decreased body weight gain. A possible biochemical basis for HCAs effect comes from its ability to suppress the production of fatty acids (and fats) through its inhibition of a cellular enzyme. Although early studies in people suggested a weight loss benefit, these were small studies with various weaknesses in their design. The first well-controlled clinical trial found that a G. cambogia extract (standardized to 50% HCA) failed to produce significant loss of weight and fat mass beyond that observed with placebo (Heymsfield, JAMA 1998). That study involved 135 overweight men and women (many of whom were markedly obese) who were given 1,000 mg of the extract 30 minutes before each meal (a total daily dose of 3,000 mg containing 1,500 mg of HCA). During the 12-week study, participants were put on a high-fiber, low-calorie diet. It has been suggested that the high-fiber diet may have impaired HCA absorption (Badmaev, JAMA 1999), although this is speculative. Two years later, a 12-week study of overweight women found that those given G. cambogia extract lost more weight than those given placebo (8.2 lbs vs. 5.3 lbs), although there was no decrease in appetite (Mattes, Physiol Behav 2000). The participants were put on a low-calorie diet and encouraged to exercise. They took 800 mg of G. cambogia extract (50% HCA) 30 to 60 minutes before each meal, for a daily total of 2,400 mg of extract containing 1,200 mg of HCA. Interestingly, a small number of men were initially included in this study but their results, which showed no significant difference from placebo, were excluded from the overall findings. A smaller, 2-week study in men showed no effect on appetite or weight loss in those taking 500 mg of HCA three times daily (Kovacs, Int J Obes 2001). One study which suggested an effect on reducing appetite and food intake but not a significant reduction in body weight or body mass index (BMI) had subjects take G. cambogia extract (60% HCA) 1 hour before lunch and dinner and 2 hours after dinner to prevent snacking in the evening. In this two-week study, each dose was 500 mg of extract for a daily total of 1,500 mg of extract containing 900 mg of HCA (Westerterp-Plantenga, Int J Obesity 2002). More recently, a study of obese women found those who took 800 mg G. cambogia extract (50% HCA) 30 minutes before breakfast, lunch and dinner (a total daily dose of 2, 400 mg of extract containing 1,200 mg HCA) for 2 months while eating a reduced-calorie diet had a significant reduction in triglyceride levels compared to women who took a placebo (average reduction of about 23 mg/dL vs. an increase of 4.5 mg/dL, respectively), but no significant reduction in bodyweight or body mass index (Vasques Phytother Res 2014). There were also no significant effects on total cholesterol, HDL, LDL, and insulin levels, nor an effect on levels of leptin (a hormone which regulates fat storage). What to make of all this? The evidence suggests that HCA may, in some situations, modestly help with weight loss, but it is not a sure thing. HCA may be more effective in women than men and in people who are not markedly obese. As discussed in the What to Consider When Using section, when and how you take the supplement may be important in determining its efficacy. See the Weight Loss Supplements Review for information about other weight loss ingredients used in supplements. Due to promotion of Garcinia as a weight loss ingredient in the popular media, many products are currently on the market and being actively promoted. In ConsumerLab.com's experience, the rapid introduction of new products to meet a sudden demand for a supplement often results in a high percentage of products of poor quality. Neither the FDA nor any other federal or state agency routinely tests Garcinia or other supplements for their quality. 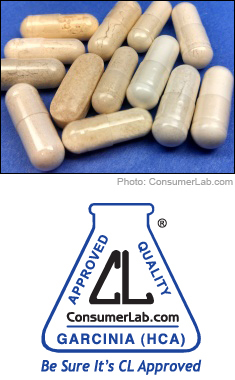 ConsumerLab.com, as part of its mission to independently evaluate products that affect health, wellness, and nutrition, purchased Garcinia dietary supplements sold in the U.S. Products were tested to determine how much G. cambogia extract they contained (based on analyses of HCA), potential contamination with the heavy metals (lead, cadmium, arsenic, and mercury), and the ability of products in tablet or caplet form to break apart (disintegrate) properly. Labels were also checked to be sure they complied with FDA labeling requirements including listing the correct Garcinia species and plant part (see How Products Were Evaluated for more details). (4/30/14): Results for one of the products in this report were featured on the The Dr. Oz Show and was helpful in getting that product removed from the market. The product was also using Dr. Oz's name without his permission. (12/6/13): The distributor of one of the products reported in this review to contain less HCA than listed, notified CL that its own recent tests of the product showed it to contain the amount listed on its label and, per CL's policy, asked that the product be retested. Retesting confirmed the problem found by CL and showed an even lower amount of HCA than orginally reported. For more details, see the Update in the full Review and a news release. Garcinia Cambogia (HCA) Supplements Review!